The scriptural passages read to-day have in mind the Eastern origin of the titular patrons of the Basilica, and tell us, therefore, of the Syrian Naaman, who, rejecting the grander rivers of Damascus, was cleansed from his leprosy in the lesser waters of the Jordan. Catechumen desiring to be healed from the leprosy of infidelity and original sin, must humble themselves, and, abandoning the rivers of Damascus- that is, the attractions if their former worldly life- must wash themselves clean in the pure waters of holy baptism. Pour forth in Thy mercy, we beseech Thee, O Lord, thy grace into our hearts, that as we abstain from carnal food, may we also restrain our senses from harmful excesses. Through Jesus Christ our Lord, Who liveth and reigneth with Thee in the unity of the Holy Ghost, one God Forever and ever. R.Amen. Lesson from the Book of Kings. In those days Naaman, general of the army, of the king of Syria, was a great man with his master, and honourable: for by him the Lord gave deliverance to Syria: and he was a valiant man, and rich, but a leper. Now there had gone out robbers from Syria, and had led away captive out of the land of Israel, a little maid, and she waited upon Naaman’s wife. And she said to her mistress: I wish my master had been with the prophet that is in Samaria: he would certainly have healed him of the leprosy which he hath. Then Naaman went in to his lord, and told him, saying: Thus and thus said the girl from the land of Israel. And the king of Syria said to him: Go; and I will send a letter to the king of Israel. And he departed, and took with him ten talents of silver, and six thousand pieces of gold, and ten changes of raiment; And brought the letter to the king of Israel, in these words: When thou shalt receive this letter, know that I have sent to thee Naaman, my servant, that thou mayst heal him of his leprosy. And when the king of Israel had read the letter, he rent his garments, and said: Am I God, to be able to kill and give life, that this man hath sent to me to heal a man of his leprosy? mark, and see how he seeketh occasions against me. And when Eliseus, the man of God, had heard this, to wit, that the king of Israel had rent his garments, he sent to him, saying: Why hast thou rent thy garments? let him come to me, and let him know that there is a prophet in Israel. So Naaman came with his horses and chariots, and stood at the door of the house of Eliseus: And Eliseus sent a messenger to him, saying: Go, and wash seven times in the Jordan, and thy flesh shall recover health, and thou shalt be clean. 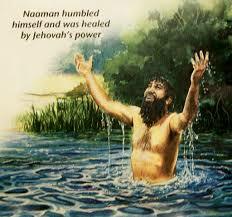 Naaman was angry, and went away, saying: I thought he would have come out to me, and standing, would have invoked the name of the Lord his God, and touched with his hand the place of the leprosy, and healed me. Are not the Abana, and the Pharphar, rivers of Damascus, better than all the waters of Israel, that I may wash in them, and be made clean? So as he turned, and was going away with indignation, His servants came to him, and said to him: Father, if the prophet had bid thee do some great thing, surely thou shouldst have done it: how much rather what he now hath said to thee: Wash, and thou shalt be clean? Then he went down, and washed in the Jordan seven times, according to the word of the man of God; and his flesh was restored, like the flesh of a little child: and he was made clean. And returning to the man of God, with all his train, he came, and stood before him, and said: In truth, I know there is no other God, in all the earth, but only in Israel: I beseech thee, therefore, take a blessing of thy servant. O God, I have declared to Thee my life: Thou hast set my tears in Thy sight. V. Have mercy on me, O Lord, for man hath trodden me under foot: all the day long he hath afflicted me fighting against me. At that time Jesus said to the pharisees: “Doubtless you will say to Me this similitude: Physician, heal thyself. As great things as we have heard done in Capharnaum, do also here in thy own country.” And he said: “Amen I say to you that no prophet is accepted in his own country. In truth I say to You, there were many widows in the days of Elias in Israel, when heaven was shut up three years and six months, when there was a great famine throughout all the earth. And to none of them was Elias sent, but to Sarepta of Sidon, to a widow woman. And there were many lepers in Israel in the time of Eliseus the prophet: and none of them was cleansed but Naaman the Syrian.” And all they in the synagogue, hearing these things, were filled with anger. And they rose up and thrust him out of the city: and they brought him to the brow of the hill whereon their city was built, that they might cast Him down headlong. But He passing through the midst of them, went His way. When I called upon him, the God of my justice heard me: when I was in distress, thou hast enlarged me. Have mercy on me: and hear my prayer. O ye sons of men, how long will you be dull of heart? why do you love vanity, and seek after lying? Do Thou, O Lord, perfect the gift of our service, which we offer unto Thee, as a saving sacrament. Through our Lord Jesus Christ Thy Son. Who liveth and reigneth with Thee in the unity of the Holy Ghost, one God Forever and ever. R.Amen. Being purified by these holy mysteries, we beseech Thee, O Lord, that we may obtain both pardon and grace. Through our Lord Jesus Christ, Who livest and reignest, with God the Father, in the unity of the Holy Ghost, one God For ever and ever. R. Amen. Defend us, O Lord ,by Thy protection, and ever preserve us from all iniquity. Through our Lord Jesus Christ, Who livest and reignest, with God the Father, in the unity of the Holy Ghost, one God For ever and ever. R. Amen.